Meeting Sarah there – who has always been my *go-to gal* for the pricey restaurants (I remember us paying out a small fortune at Rouge tomate a few years ago)… and while we sat and caught up on our holiday news and sipped on some house wine… they brought over some ricotta with olive oil, basil and chopped tomato, and some crackers to dig in with (very yum). 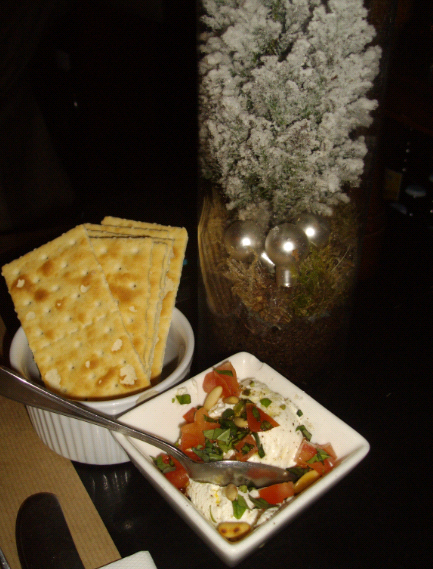 As their menu is seasonal, it changes based on what fresh produce was available on the day or the week…. and written up on a black chalk board. 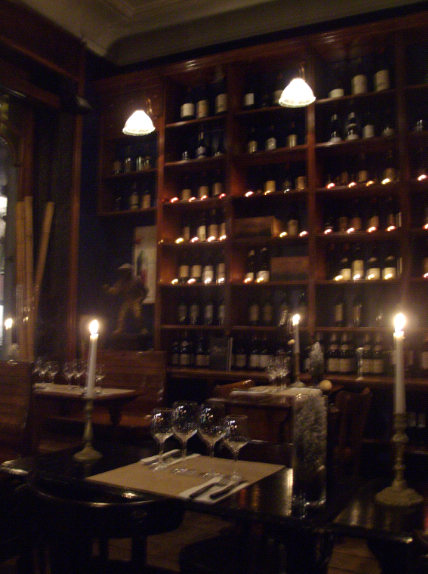 Plus the interior is warm and cozy – with a feeling of being on a train (especially since the window side of the restaurant has old train benches at the tables) and this is what I call a *1st date, trying to impress* romantic dinner venue! I saw Foie Gras Maki on the menu as a starter and I was sold….especially since Sarah agreed that we should share the starter portion. (17€) Now here, I have to admit that I was bowled over (in a good way) with the portion size … it was enormous for a starter and perfect for 2 people to share!! it was definitely a 10/10 for me!!! Plus they brought a basket of bread to the table with butter…. shooo-wow! 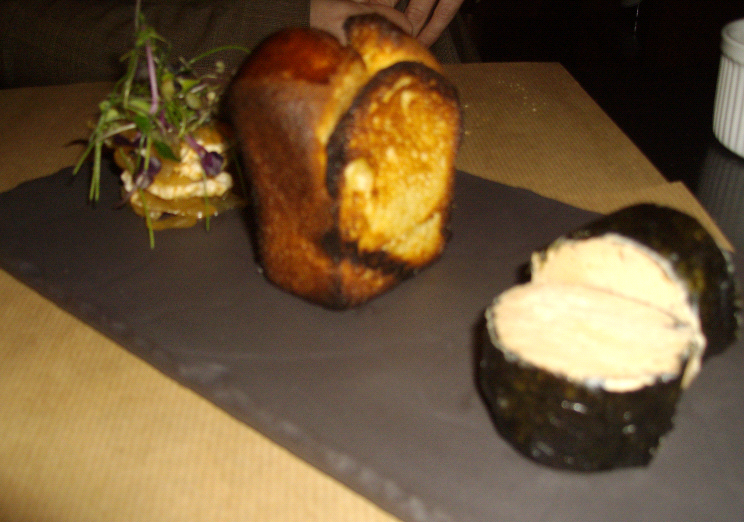 picture is blurry – but it was served with toasted brioche and some pickled onions…. Sarah then opted for the St Jacques (scallops) served with an interesting array of vegetables (all thinly sliced and what seemed to be pickled) as well as some prosciutto. 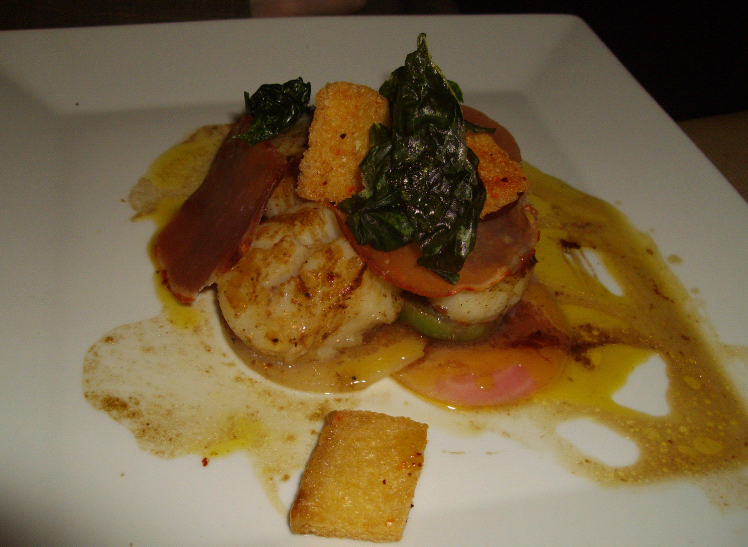 For 27€ – I felt that the portion size was more on the starter version that a main course…. but Sarah said it tasted great….and as long as she was happy… that is all that matters. 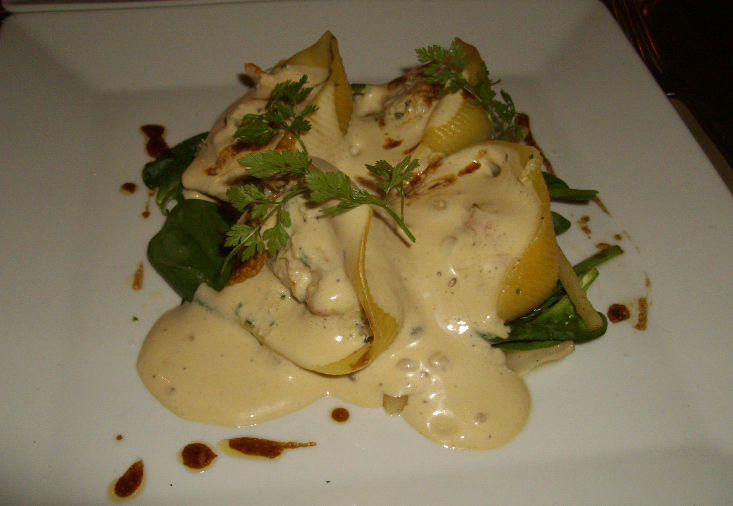 and I liked the idea of the crab and prawn filled pasta with root vegetables…. beautifully presented, pasta cooked to perfection – just al dente enough… but I was a little lost with adding of the root vegetables (parsnips) to an already carb-ie meal and again – for 28€, a little on the steep side. I very rarely think twice about visiting a place and I know that En Face de Parachute is widely respected in the foodie industry in Brussels, but to be honest… it was good in my books, but for the price… I really expected it to be excellent, a little bit more than *just good* …so am not sure that it would be on my repeat list…. (is that wrong of me??) Plus, once we were seated, we were pretty much boxed in by all the other tables and chairs… as the spot is really tiny and they have maximised every inch with dining possibilities.